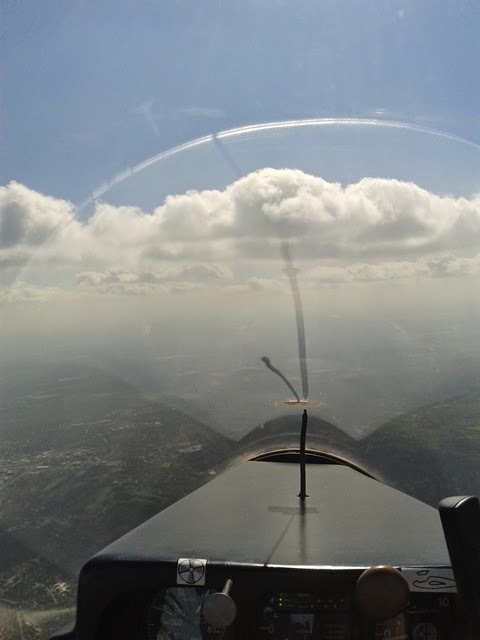 After a couple of days of weather imposed rest, the competition was back into full swing with a middling forecast, possible cloud bases of 3,000/4,000ft and 2/3kt thermals. 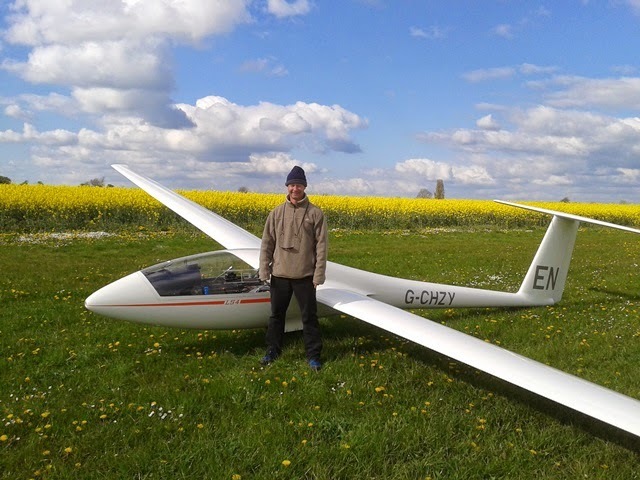 There was an impressive grid set up with 15 gliders ready for first launch at 12:30 for the task of Stokenchurch South - Ravensthorpe Reservoir - Booker SW - Booker Airfield for a Task length: 167.5km. 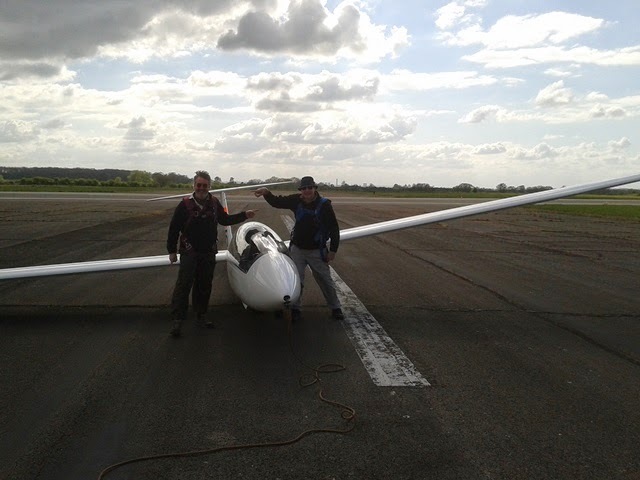 With club members happily soaring there was no excuse but to launch and the start line opened at around 13:30 although the cloudbase was at various heights from 2,500ft to 3,500ft around the airfield but most importantly everyone set off. Unfortunately the day didn't work out as forecast and soon Shelagh was kept busy in the clubhouse taking calls from all the landouts. 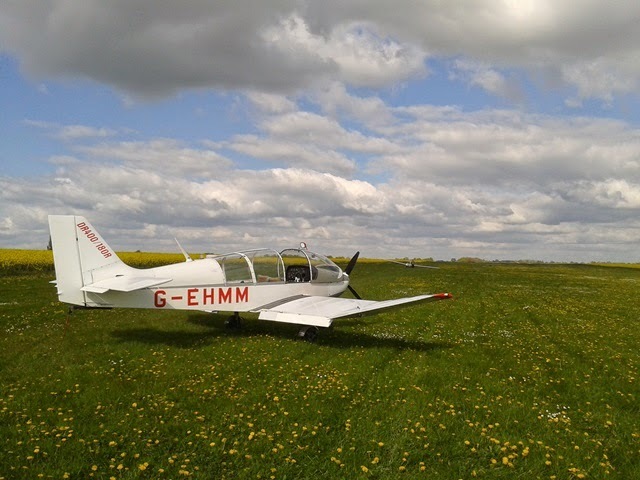 Thame proved a popular bolt hole with CEH, JDV, 405 and 118 all landing there - they had a friendly reception from some of our old friends at Thame with Henry O and another Thame member coming up to the field and helping tow the gliders back. Rob looking pleased with himself having beaten the plastic toys again! Bicester reined in J1M and LC - aerotows being provided locally (although LC had an interesting 'Cooks' tour back routing via Kidlington/Brize before he took command and steered his tug pilot in the right direction. Lastly we had 844 landing at BOB - it was pointed out to Symeon that it was a glider trailer we used to leave in the field, not a glider to signal when the start line was open (for those of you old enough to remember comps before GPS and when photos were required). Provisional honours for the day went to Richard C (F1), with Simon V (Y2) and William P (LC) 2nd and 3rd respectively (although nobody scored any points for all their hard efforts). General concensus though was that a good day was had by all. Sunday proved as wet as forecast, so the Comp reconvened on Monday for Day 2. The briefing started with prize giving: 3rd place Jim and Jeremy (315), 2nd place Nils (EN), 1st place Bob (279) whose 'how I dunnit' included highlights like hanging around for 45 mins at Didcot and 45 mins at Bicester. The champagne was well deserved for endurance and determination. Back to the flying. The task set was Didcot-Bullington-Goring. As the sky became more threatening this fell back to Oxford East-Chieveley. The grid launched, milled around for a while and then arrived back at ground level, in time to derig before the heavens opened. Next opportunity may be Wednesday. Plenty of action at the launch point today (as there was yesterday with many pilots practising for the comp) with eleven competitors taking to the sky for day one of the Booker Rules Handicap competition. A task of 160.7km (Stokenchurch, Didcot, Newbury, Bicester, Hambledon Church) was set under a promising sky with a 15kt easterly wind. Early spread out around Booker prevented a few from starting but the more intrepid set off to better looking clouds on track. There were soon a few calls coming in from landouts, most pilots opting for the easier option of airfields with the chance of an aerotow retrieve (although not all the airfields were receptive to the idea of letting aircraft take off again!). Honours for the day go to Bob Smith (the only finisher) with a creditable speed of 52.2kph, 2nd place to Nils Wedi (136km) and 3rd place to JimWhite/Jeremy Gilby (96km). 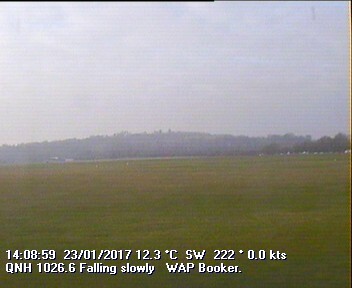 Sunday's forecast isn't looking to good but the forecast for Monday is looking good again so there should be some good flying. After the success of the Bronze C course last week, the run of soaring weather has continued with Sunday and Monday giving some exciting soaring. 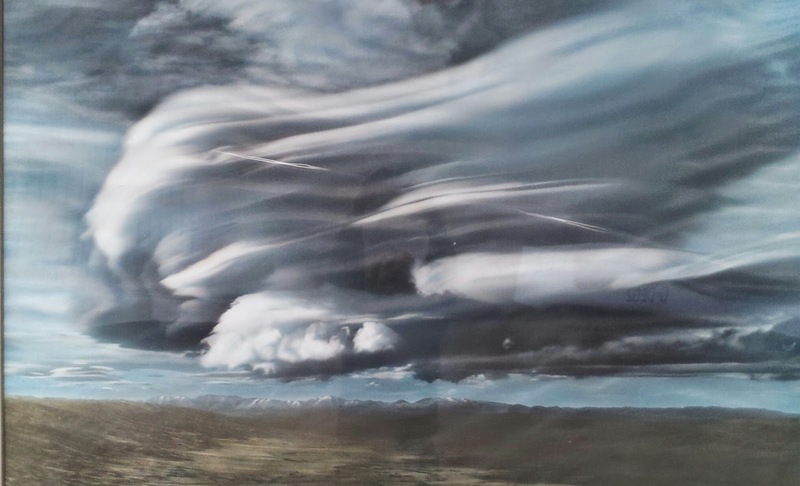 Sunday was interesting with some good lift to be found but without a very high cloudbase and a very noticeable shear around 2000' where a 10kt westerly became a 17kt northerly. The general opinion was that the thermals were broken and not where you expected them to be under the clouds. This didn't stop Jim in J1M and Tim in Z3 from doing a 260k task under the new handicap task rules format (which can now also be entered on the National Ladder) - hopefully the first of many flights to be flown and entered this way. Monday had a better forecast with a reasonable northerly wind 3/4 knots predicted. Success was had by Stuart Whitehouse doing his 50k O/R to Enstone (for the second time after a logger failure when he did it last summer) and Richard Eaton with his Silver Duration in ECZ. Other flights included 987 and KV both doing Bicester Didcot, 949 and F1 to Hus Bos and Wellesbourne respectively. The good news is that the rest of the week is still looking good if possibly going blue. Thursday provided a variety of non-aviation opportunities. After some model flying John went trout fishing, didn't catch anything. Simon and Yan went to Ystradfellte where Simon led the way up some hills and Yan took lots of pics of waterfalls. The guitar party went to Gilwern and did a circular walk including the Monmouthshire and Brecon canal and the River Clydach - and sheep - and ended up in a very nice tea shop in Abergavenny. Towards the end of the day the heavens opened, roads ran with rivers of red water (from soil run off - or possibly Sahara dust). Gastronome report: The guitar school had three types of sausages with onion mash, followed by fruit salad. The Treasurer's party were fed by Chef John who sacked three sous chefs before producing a 3 course feast: steak with tomato and onion bruschetta, pork chops with onion and mushroom sauce, sauté potatoes and glazed carrots, and (half price Co-op) vanilla cheesecake. On Friday the day dawned grey again but the forecast was for south westerlies and lo and behold it was right. We were treated to an afternoon of sunshine with the ridge working all down the Cwmdu Valley, with thermals to help out. All in all a very enjoyable trip, although of course the weather could - as always - have been better. Many thanks to Black Mountains GC for their hospitality and to Richard Crockett for his hard work in organising the trip and for all the flying he did. 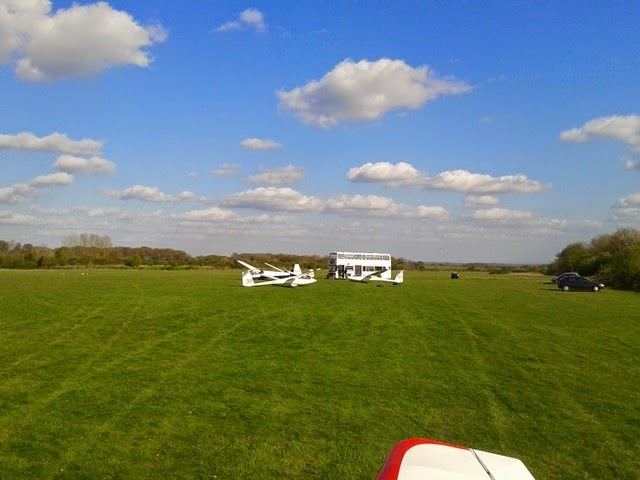 Sunny Tuesday ended with some calm evening flying and some rather more exhilarating strap-hanging as Richard practised a few rolls and other figures. Yesterday was a scrub and the party divided, some setting off for the model shop in Abergavenny where James bought 'something sporty' (a Riot) while the more active group went for a muddy walk to Llangorse Lake. Gastronome report: The Treasurer's household finished off the honey roasted gammon with potato pancakes , the guitar workshop had fish pie. Today we have more of the same. James is 'test flying' his new toy, John is planning on trout fishing, the rest are contemplating. Southwesterly forecast for tomorrow, in which case we will be ridge running to our heart's content. It rained a lot in the night and this morning we awoke to fog, but driving up to the airfield got us back into the sunshine. We had to wait for the valley mist to clear before launching - don't want to be looking for a cable-break field in fog - but then we were treated to a gloriously sunny day with a mix of ridge and thermal. None of it was very strong but it was enough to tempt a fleet of single seaters into the air, locals and Booker members. A couple of new people turned up from Booker. For James the PPL Instructor and tug pilot it was a new experience. Bob 279 has been here before but he was pleased to see some dramatic wave when he arrived. The man with the clipboard kept everything in order. The Treasurer has gone off to prepare dinner for the CFI and the other members of his household - honey roasted ham is on the menu.